Oplev to top Barcelona-steder på denne 8-dages dagstur til Colonia Güell og Montserrat. Stop af Colonia Güell, en af de mere spændende projekter af den berømte arkitekt Antoni Gaudí. Derefter bestyres rackbanen for en tur til Alpins tilbagetog i Montserrat, hvor du vil tage en underlig udsigt og se det benediktinske kloster. Denne delvist guidede udflugt omfatter også fritid til at vandre de to steder i dit eget tempo. Denne delvist guidede dagsudflugt er en god chance for at komme uden for byen, mens du udforsker det fantastiske landskab og fascinerende arkitektur i Catalonien. Start din dag kl. 8.30 ved busstoppet ved Pl. Catalunya, foran El Corte Ingles stormagasin. Derefter leder du til Colonia Güell, en arbejderby, der først blev bygget i 1882 af den berømte Barcelona-arkitekt Antoni Gaudí. Nyd et guidet besøg inde i Gaudís krypt, en slående kirke bygget af arkitekten, men aldrig afsluttet. Hoved ved siden af Montserrat, et malerisk bjergtop tilbagetog lige udenfor Barcelona. 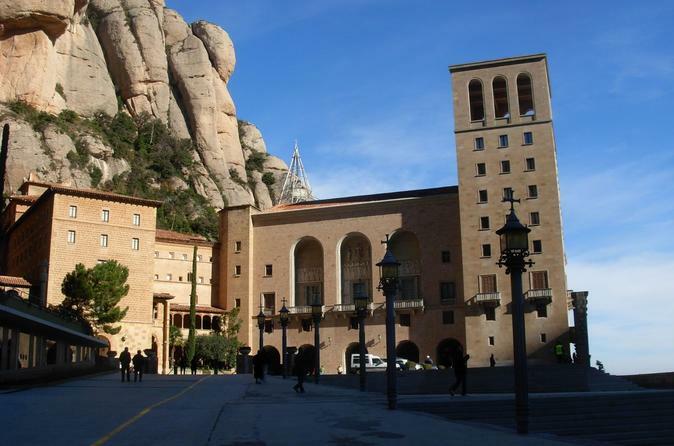 Montserrat er også kendt som synet af et benediktinerkloster, der dateres til det 11. århundrede og til Virgin of Montserrat, en religiøs artefakt beliggende i klostrets kongelige basilika, der fejrer denne skytshelgen i Catalonien. I løbet af din tid på Montserrat har du også mulighed for at køre til højeste punkt på bjerget via rackbanen, hvor du vil tage en fantastisk udsigt over det omkringliggende landskab. Tilbring lidt ekstra tid på Montserrat og udforske stedet på din fritid, og tag en pause for at prøve nogle spanske retter til frokost (egen regning) på en af de nærliggende restauranter. Din guide vil også være tilgængelig, hvis du har spørgsmål om webstedet eller om dagens rejseplan. Din tur slutter med drop-off tilbage ved dit oprindelige afgangssted. Our guide Marc was wonderful and knowledgeable. The best part of the tour was the exclusive and private access to Colonia Güell and the Monestary music school and choir performance. We had an excellent day. A great day out - although we did feel it was a little long...didnt need to have quite so much time at Montserrat. Great to be able to skip the queues and see the Black Madonna...........a little to long wondering through the school boys choir dormitory. Unfortunately they were on school holidays when we were there so didnt hear/see them sing. This was one of the best day trips during our 2-week trip to Spain. Laila, our tour guide, was exceptional! She explained everything very well and was very much conscientious of the needs of the people in the tour. The tour is well-organized. Everyone is given a one-way bluetooth headset so that you can hear clearly the guide speaking. Colonia Guell was pretty interesting. The church was amazing. The church is a Gaudi masterpiece that you don't hear often but it's worth a visit. Montserrat was wonderful! I think we were lucky because there weren't too many people. It was just unfortunate that the Montserrat boys choir was on break the week we came it was a week after Holy Week and they sang non-stop during Easter week so this was their scheduled break. We had an exclusive tour of the facilities of the boys' choir school and we didn't have to line-up to see the Black Madonna. After the tour, we literally came out just beside the huge altar and had an unobstructed view of the altar and 1PM prayer. Mark was a fantastic tour guide. Very detailed in his explanations. Lovely day! We had a terrific tour. The balance of guided time versus free time was perfect, both at the Colonia and at Montserrat. Our guide was very knowledgeable, and enhanced our appreciation of both destinations. It was a delight to hear the boys choir sing. I recommend this tour highly. This is a trip not to be missed. While there are a multitude of trips to Montserrat I didn't see any other trips that included Colonia Guell and the Gaudi Crypt, indeed I hadn't heard about the Gaudi Crypt but would highly recommend it if you have the chance to go. 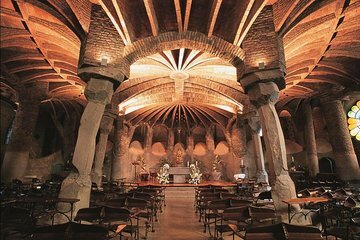 The crypt had all the components of La Sagrada Familia. Montserrat itself is beautiful. I would highly recommend the art gallery as the collection is really amazing. If you are looking to join an organised tour to Montserrat then this is the one to get. We liked it a lot!!! Very well organised and informative tour. We both really enjoyed the day. A good mix of organised part and free time. I sent my parents and my 8 and 9 year old children on this tour. They came back raving about their day. Their tour guide Alex was very informative and they had exclusive access to a few things that many other tours did not provide. They loved hearing the boys choir sing. They were also very intrigued by the things they learned in Colonia Guell. They had packed a lunch to bring with them which made it possible for them to make the most of their free time. They truly had a wonderful experience.